If you look upon the mournful, decaying figure sat atop that webbed plinth above and don’t immediately think of Zdzisław Beksiński then you aren’t familiar with his work. And if that’s the case then you might not fully realize the appeal of Scorn, the videogame that this concept art informs. Time to change that. What Beksiński did with bone haunts. He was a Polish artist, best known for his many paintings, especially the gothic fantasy that dripped from his brush during the 1970s and 1980s. But Beksiński’s gothic fantasy isn’t like any other: forget about crows, full moons, and vampires. 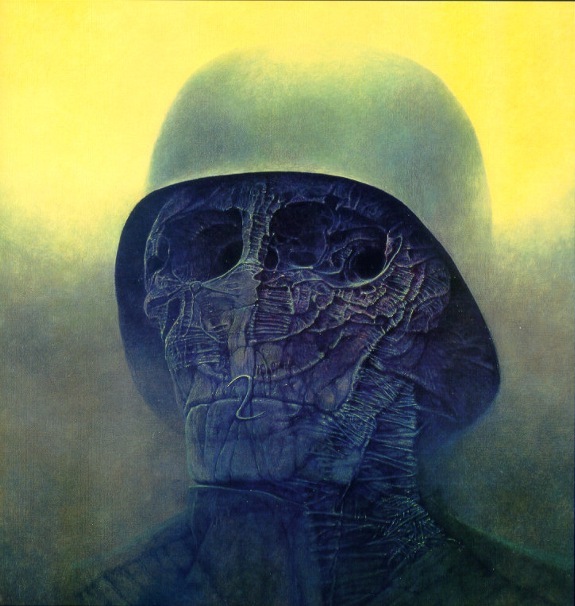 He rarely spoke of it, but Beksinski’s younger years saw the horrors of World War 2 and the holocaust spiral around him—that has to have an effect on a guy. “I wish to paint in such a manner as if I were photographing dreams,” Beksinski said. But where did these dreams come from? The piling bodies, recurring osseous matter, gutted deformities; it all speaks to a vernacular of despair that too much resembles the most graphic and depressing images to emerge from the extermination camps. Something stuck. All of Beksiński’s paintings are untitled as he didn’t want words to lead to a misunderstanding of them. No matter: these paintings speak for themselves. They let you peer into entire unearthly worlds, which is of course the purpose of any fantasy, but these are worlds you would not want to visit under any circumstance. The taint of hell is here. Terror is here. There’s an oil painting of a mass of bodies all cramped and crushed together, all raw-boned legs and elbow joints, hundreds of limbs like a vehicle made of spider legs, anguished faces floating in space, some have horns—it’s fucked up. What’s most remarkable about Beksiński’s depiction of bodies is that it evokes our own confused and terrified relationship with death and decay. What comes of us and our physical selves once we pass away? His paintings confront us with this question without remorse. One is a portrait of a solider—you can tell by the helmet—who must be dead given that only a skull remains, but the bone has the venous detail of tissue, almost as if the afterlife has latched on and started leeching the mineral decay. But this face, my god, nothing is flat and smooth like a typical skull; it has strata, a neck like the ladders in tights, several parts are softly dented and the eyes are gouged into abyssal cavities. It’s like it has its own architecture. And that’s a common theme throughout Beksinski’s work: the dead body as construction material. He has cathedrals, chairs, towers, and staircases made of coffins, skulls, and ghoulish cadavers. Other times it’s the bodies themselves that have been carved into, shaping out ridged roofs and living spaces where there were once organs—a sublime horror. Often, it looks like the bodies have been brought back from death into a painful existence all in order to stretch themselves across the walls. It’s a fantasy that acknowledges only a profane death, denying the holy burial, and one in which the body is reused to hoist the landscape out of horrific icons. Switching gears, Beksiński’s spread to videogames is rare. Prominently, the devastated rusty world of Ilos in Mass Effect (2007) is said to have been styled after him. Last year, Tormentum: Dark Sorrow made a more obvious effort through its barbarous world of dried flesh and suffering. But have a look at Scorn, would you? Now this appears to be a videogame worthy of citing Beksiński as an inspiration, hence it being this article’s raison d’etre. What does a Beksiński world sound like? A lot of Scorn‘s concept art seem to be conceptual extensions of Beksiński’s work. It carries that same notion of taking place in a world where the body is used as architecture. But it’s notably more fleshy and wet than anything that Beksiński ever painted. That may be the result of crossing influences with the more famous artist H. R. Giger, albeit without the disturbing sexual imagery associated with him. Giger of course being known for his work on Alien (1979), specifically the monster itself as well as the egg pods and nest design, all of it black, bony, and oozing. That’s probably why the bodies, walls, and machines in Scorn aren’t lined with the type of arid gossamer that Beksiński’s models so often were, but with something that is less decayed and dried out, much more intestinal and abdominal in style. But underneath those ribbons of flesh and the tapestries of tissue are the bones of Beksiński’s masterworks, and it’s the most visible aesthetic inspirations of Scorn. This is good—Giger shouldn’t get all the attention. It seems that the people making Scorn also want us to experience it as you would looking through the sprawling online galleries of Beksiński’s collected works, too. You’ll be “thrown into the world,” moving in first-person without a HUD—in other words, with no text and only the sights of this somber place to guide you. Apparently, this labyrinthine world is made of many interconnected parts that each have their own theme, all of them open to your exploration from the start. There will be weapons and combat, but hopefully that won’t overcome the bigger aspiration here, which is to have the main character be this terrifying “lived-in world.” Scorn should also finally move us closer to answering questions like: What does a Beksiński world sound like? How do the creatures that inhabit it move and behave? You can find out more about Scorn on its website. It had a failed Kickstarter in 2014 but has since been funded by a private investor.